28S-WAW-A06 is a ‘28Standard’ 4Ground kit, as you would expect it has loads of detail and pre-painted parts. This set of telegraph poles is typical for the 1940’s and can be found in many countries. They make great scatter terrain and can be used as objectives in espionage missions. 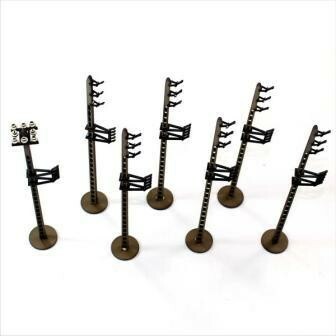 The set comes with the option for some of the poles to have ceramic tops to allow electric cables to be carried on them.